Independent Directions to this Site: From Highway 417, 39 km east of Ottawa, take the Limoges exit (79) and go NNW for 4.4 km on Limoges Road (CR 5), through the town of Limoges to the junction of this road with Regional Roads 8 and 37. Follow the right hand curve on Regional 37 or the Saumure/Clarence-Cambridge Boundary Road northeast for 0.9 km to where Saumure turns left. Then continue straight northeast on the Clarence-Cambridge Boundary Road for an additional 5.4 km to Fisher Road North of Clarence-Cambridge Boundary Road. Turn left or NNW onto Fisher Road. Larose Forest Loop Route Directions: From the Gagnon Trail at Clarence-Cambridge Boundary Road, go east on the Clarence-Cambridge Boundary Road for 0.5 km to Fisher Road. Turn left or NNW onto Fisher Road North of Clarence-Cambridge Boundary Road. Map of the Fisher Road North of Clarence-Cambridge Boundary Road Area Click on other site numbers to go to their pages. 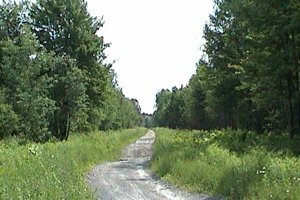 Site Description and Birding Information: Fisher Road (sometimes labelled "9") North of Clarence-Cambridge Boundary Road is a dirt road, which soon deteriorates into a dirt track, giving access to the northern portion of the Larose Forest. It can be driven, at least partway, with great caution, during drier times of year; but it isn't recommended. It is far better to drive the short distance into forest lands and pull off and park where possible and walk into the woodland along the road. 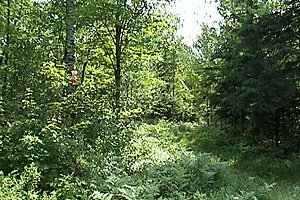 The forest is mixed deciduous and conifer with scattered wooded swampland. About 0.7 km from the Clarence-Cambridge Boundary Road, you will come to the ski trail; at 1.5 km the ATV trail (Rd 25), and in 3.1 km St. Felix Road. The area can be quite wet in any season but winter, so boots are recommended in warmer months. Insects can be bothersome at that time too. 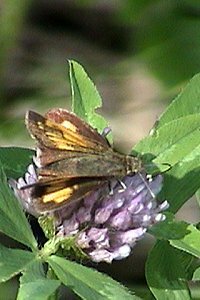 As well as being good for birding, especially in migration, this trail is excellent all summer for butterflies and dragonflies. Larose Forest Loop Directions: From Fisher Road at the Clarence-Cambridge Boundary Road, go east on the Clarence-Cambridge Boundary Road for 1.3 km to Croche Road. Turn left or NNW into the next site on this route, Croche Road North of Clarence-Cambridge Boundary Road.